JAKARTA (Reuters) - U.S. mining giant Freeport-McMoRan Inc warned on Monday it could take the Indonesian government to arbitration and seek damages over a contractual dispute that has halted operations at the world's second-biggest copper mine. In an escalation of the dispute, Freeport Chief Executive Richard Adkerson also said the company's local unit had made its first layoffs since negotiations started in January over a new mining permit, and it may let go more workers this week. The row, which centers around the sanctity of Freeport's 30-year mining contract, comes as Indonesia seeks to squeeze more revenue out of its mining industry through a shake-up of regulations over foreign ownership and ore processing. 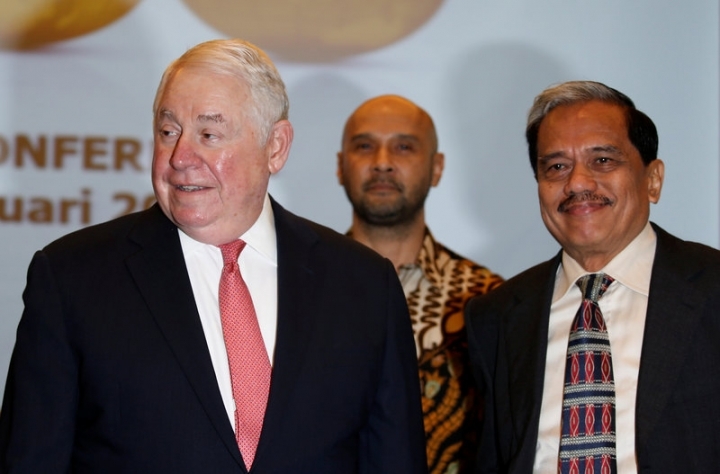 "Right now we are at an impasse with the government," Adkerson told a news conference in Jakarta. Freeport has been at loggerheads with Indonesia over the terms of a special mining permit to replace its contract of work, after halting its exports of copper concentrate due to the new mining rules. On Friday, the miner said it could not meet contractual obligations for copper concentrate shipments from the mine following a five-week export stoppage. Last week, all work was stopped at Freeport's giant Grasberg mine in the eastern Indonesian province of Papua. Assuming the export ban continues and operations resume at a local smelter in March, Freeport estimated its first-quarter sales would be reduced by around 170 million pounds of copper and 270,000 ounces of gold. That is equal to a reduction of some 17 percent in Freeport's total first-quarter copper sales and 59 percent in gold sales, the company said in a statement later on Monday. The Gresik smelter was forced to halt operations on Jan. 19 because of a labor strike. Freeport's existing contract of work is still in place based on legal advice, according to Adkerson, and the company has notified Indonesia's mining ministry of what it says are government violations of the contract. That starts a 120-day period for the two sides to settle the dispute themselves. "At the end of that period if this dispute is not resolved we reserve the right ... to commence arbitration," Adkerson said. "I sincerely hope we can find a compromise." The company also warned of "severe unfavorable consequences for all stakeholders" if no resolution is reached. The consequences could include "the suspension of capital investments, a significant reduction in domestic purchases of goods and services, and job losses for contractors and workers as we are forced to adjust our business costs," it said. Adkerson said about 10 percent of the expatriate workforce was laid off on Friday, and this week "we will be releasing contract workers." Of Freeport Indonesia's 32,000 workers, only 12,000 are employees and the rest are contractors, he said. "Do they want business or a lawsuit?" Indonesia's mining minister, Ignasius Jonan, asked in remarks to reporters on Monday, responding to Freeport's warning that it could take the dispute to arbitration. The government would try to reach an agreement that "doesn't break the law and that continues to honor the contract," but failing that it could also seek arbitration, he said. Jonan said on Saturday that going to court would be a better option than "firing workers to pressure the government." The layoffs were not a negotiating tactic, Adkerson said, but "only to keep the business financially viable." 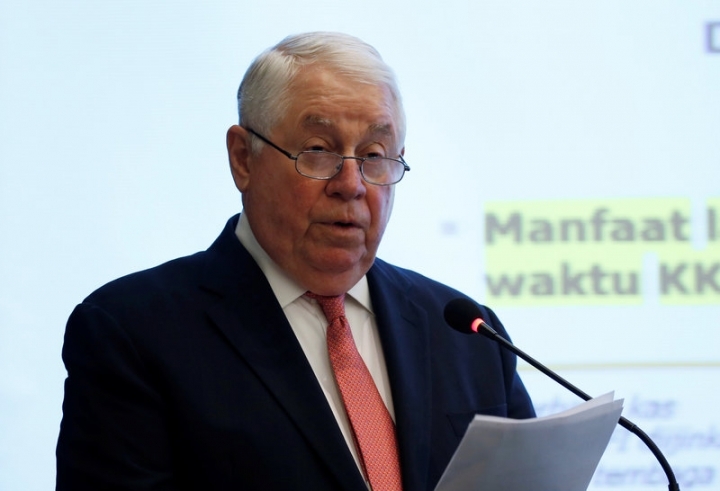 Adkerson said Freeport was committed to staying in Indonesia. The mine is critical for Papua, with contributions from Grasberg representing around one-third of the province's economy, he said. The chief executive of Freeport's Indonesian unit, Chappy Hakim, appointed in November to navigate through the regulatory uncertainties, resigned on Saturday. Adkerson said the company was still assessing his replacement. Under its current contract signed in 1991, Freeport has invested $12 billion in Indonesia. But it cannot make $15 billion in additional capital investment for further development without fiscal and legal guarantees from the government, Adkerson said. How Indonesia handles the dispute is being watched from afar, he also noted. "Millions of U.S. citizens indirectly invest in Freeport with their savings accounts and their retirement plans," Adkerson said. "So what happens ... will be a matter of interest for the U.S. government." He said activist shareholder Carl Icahn, who holds around 7 percent of Freeport-McMoRan shares, was "very concerned about what is happening." Grasberg was expected to produce 800,000 tonnes of copper in 2017, about 3.5 percent of global supply, said Jefferies analyst Chris LaFemina.